Fai una nuotata con squali balena, delfini e razze a Isla Mujeres in questo tour guidato. L'isola messicana, situata a circa 2 miglia (3 chilometri) al largo della costa di Cancun, vanta un sacco di pesci colorati e vita marina da scoprire. Inoltre, esplorare una barriera corallina e poi gustare ceviche fresche, sandwich e bevande a bordo della barca. This tour is a once in a lifetime experience! Should you spend the money...YES!!! Not scary at all. The crew took care of everything even thought the boat ride was super rough-not sure that can be helped. It was about an hour ride to the whale sharks. There were a ton of boats and eventually Mani told us we were moving to another location not as crowded. Jose went in with 2 of us at a time and we got so close a fin hit me we can't touch them. You are about as close as close can be. They gave us drinks on the boat, sandwiches and ceviche at the end. It was a great day! My kids are 8 and 11 and loved it! Please, if you are near a place where you can see these beautiful animals go and do it! Great and unique experience! Our tour guides were nice, but the boat could definitely use some upgrading. There were a ton of other whale shark tours going on while we were out there, and tour felt a little 'sketchy' compared to the other ones we saw just based on the boat and equipment the other tours had. 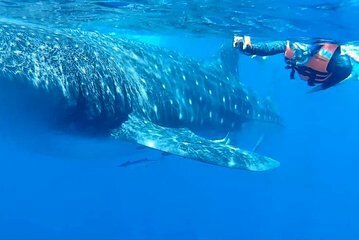 Swimming with Whales was amazing. We looked after very well and had at least three opportunities to get into the sea and swim with this amazing creature. It is a once on a life time experience. Following a good lunch there was also the opportunity to snorkel at a reef and swim in the beautiful sea. The sea was choppy but this was obviously not in the control of the organisers.